Home coverFX spring 5 Must Have Makeup Products for Spring! Happy Spring! Boy am I glad that we're out of Winter. I've been rocking Spring Time makeup for the last few weeks, but now that we've officially entered the season I wanted to share with you my top 5 products to get you ready! Now that Winter is behind us, you can dial back on your foundation. The CoverFX CC Cream is great because it's super nourishing and you can wear it light during the day or build it up at night. With Spring allergies, I like wearing a CC Cream because it protects from my sensitive skin from the elements with ingredients like SPF30. Bring some color back into your life! An easy way to do this is to apply a peachy pink blush. This is flattering on everyone! 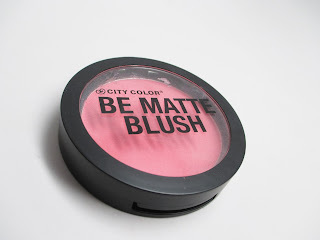 I love Fresh Melon blush from City Color Cosmetics. It works on every skin tone and is super affordable too. What better way to embrace the season than with dewy skin. I am obsessed with the CoverFX Illuminator in Sunlight. I've been getting so many compliments on my skin. I place this on the tops of my cheekbones, above my blush, for a really pretty, glowy look. Time to break out those pastels and fun shades for Spring. In Winter, it was all about vampy and smoky, let's lighten it up! I love these new Metallic Shimmer Shadows from Alcone - especially the tan #19 and pink #23 - great lid colors that you can mix in with mattes for a complete eyeshadow look. Sadly but surely, my wine and plum lip colors are making way for pinks, peaches and punchy shades. Revlon makes some great lip butters that are super moisturizing in the lingering cold but in so many shades - Peach Parfait is a nice coral that makes wearing the in trend orange lip so much easier. I love that CC Cream. Their cream concealer is good too. I'll have to look into that illuminator next time I go.